Melbourne, Dec 26 : Poking fun at Australian skipper Ricky Ponting, his South African counterpart Graeme Smith has given him a crash course on the etiquette of body language. In a week during which Ponting has faced strong criticism on several fronts, Smith strapped on the Boxing Day gloves by claiming his opposite number had been a captain under pressure for some time, the Daily Telegraph reported. Smith has privately told his teammates that he never wants to act like Ponting did in Perth, standing with his hands on hips when bowlers were under the blowtorch on the final day. The Proteas skipper claimed that Ponting's negative body language had been a hot dressing-room topic among the South African players. "Everyone saw it pretty clearly," Smith said of Ponting's body language blunders in Perth. "Our team certainly commented on it. I think he (Ponting) has been under pressure for a period of time now. It's certainly been nice to fly under the radar in this period of time and we can focus on what we want to do and stay out of the mess. "I certainly think he (Ponting) would be feeling the pressure, he's a very competitive guy. We knew that if we could get that win in Perth . 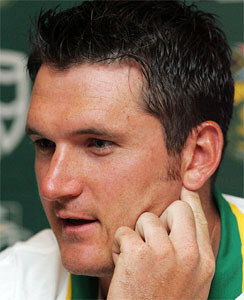 . . the media seems to put you under pressure and that''s the nature of sport these days," Smith added. Smith even passed on his own advice for better on-field body language, and said: "As a captain, no matter how you are feeling, you need to provide that confidence for your players, even if you don''t believe in what''s happening or the situation."